Yes, we are all like sheep, at least that’s what Isaiah 53:6 says. This means that we are weak, prone to go astray and Isaiah says we’ve actually done it — we’ve turned every one to his/her own way. But, our great hope this week (and every day) is that on Christ was laid all of our iniquities. My sermon from 4/1/12AM entitled Like Sheep from Isaiah 53:6 reveled in these truths. In the evening, my small group finished Jerry Bridges’ book Respectable Sins. To say this book affected us is an understatement. God used this to not only reveal sin, but to deepen our dependence on the Gospel. There are so many good elements and fruit that my group shared. If any of you are interested, Bridges kept pointing to Thomas Chalmers’ Expulsive Power of A New Affection. Click that link and digest that content to see what Chalmers (and Bridges) were driving at. Have a great Holy Week this week. This fairly consistent positive imagery is completely shattered by rather contradictory images of appalling disfigurement (Isaiah 52:14), the absence of the majestic look of a king (Isaiah 53:2), mistreatment and rejection, lack of respect and suffering (Isaiah 53:3-4). The unusual theological explanation is that he suffered, was pierced, and was crushed for the sins of others (Isaiah 53:4-5). Although he was innocent (Isaiah 53:9b) and righteous (Isaiah 53:11), he did not object to this suffering (Isaiah 53:7b), so he died and was buried among because of the sins of others (Isaiah 53:8-9). Even more astonishing, God himself caused the iniquities of others to fall on him so that peace and healing could come to many others (Isaiah 53:5b, 6b). Surprisingly, it was God’s will for him to pay for the restitution of others (Isaiah 53:10). On the one hand this looks like a terrible perversion of justice, but on the other hand it was part of God’s unbelievable plan to transfer the guilt of many to this innocent Servant. He functioned as a substitute who took the penalty of others, and through this act he justified many (Isaiah 53:11). 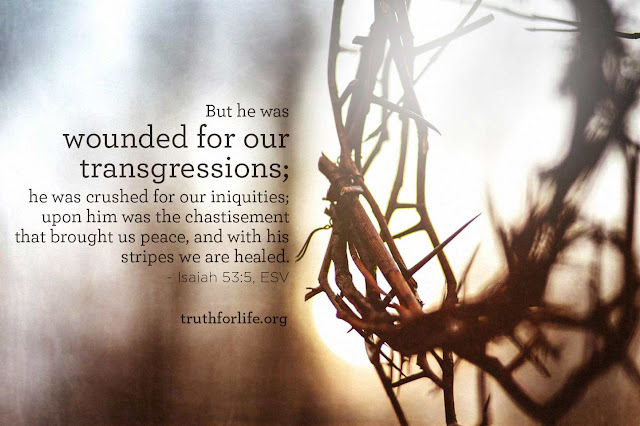 In spite of the unjust treatment of this Servant, this amazing story has a surprising and positive ending, for the Servant’s substitutionary role cause the will of God to be accomplished (Isaiah 53:10). This suffering Servant will not only live again and see the light (Isaiah 53:11); he will be exalted again because he bore the sins of many (Isaiah 53:12). Even the Old Testament was telling of this Jesus who would come and not only die but rise for sinners.